Happy July 4th a day late. I've spend a leisurely weekend just lounging. I have to head to Iowa in the next few hours. I will be installing equipment on a road construction job in Fort Madison tomorrow morning at 10. I'm going to see my mother. It won't be a long visit. I'm fairly certain I need to be on the road early tomorrow morning to be where I have to be on time. The weather is supposed to be nice. Rain on Tuesday so I think just taking off the windows is all I can do. It rained most of yesterday. For some reason, it was far noisier around the neighborhood this year than in past years. 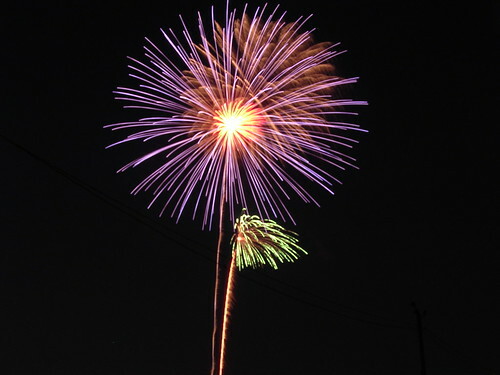 Fireworks, beyond sprinklers, small firecrackers and smoke bombs, are prohibited in Illinois. Certainly what went off several times over the last 3 days has not been of the "small" variety. I was tempted, when one blast shook my house, to call the constabulary, but I know they had their hands full last night. It got really foggy last night late, the kind of fog I love to walk in. When I went to bed the fog had blurred the house lights across the street. I almost expected to see Humphrey Bogart, trench coat and cigarette, leaning against the street light north of my house, as he waited for Lauren Bacall or Sydney Greenstreet. Shall I go see "Public Enemies", the new Johnny Depp movie about John Dillinger? I have a date Wednesday night. He has suggested dinner and a movie. I'm not a rabid Depp fan. I would probably go to see the locations around Chicagoland which were used for filming. I heard the ending is not how Dillinger died. As it's something of shrine in Chicago, perhaps I should go so I can say, "That's not what happened". Some day, I should take the "Gangster Tour". I was invited to the neighbor's cook-out last night, but the thought of jockeying for protection under a tent from the steady rain was not my cuppa. I made cheeseburgers and cottage fries and had myself a Belhaven Scottish Ale. Perfect holiday fare. Time to move on to other things. I don't like leaving a messy house. Pam is coming over to feed the girls tonight and tomorrow morning. I'll be back in the late afternoon. I need to clean litter boxes, damp mop floors and pack a bit for myself. Then I head over to the office to pick up the equipment and I'm good to go. Gas here is $2.79/gallon. What will it be in Iowa, I wonder? I can't believe no one's using http://www.iowastategasprices.com but that means I can't tell you prices in fort Madison.